I was very excited about our recent announcement that AmericanAncestors.org is digitizing the parish records of the Archdiocese of Boston. I had viewed some of these records in the past at their offices in Braintree. Some of the volumes had been in quite fragile shape, and having them digitized, and ultimately indexed, is going to provide greater access to an under-utilized record source. When the records went online, I decided to browse some of the early volumes. While people with Catholic ancestors in other areas such as Quebec and Latin America can often find mothers’ full maiden names on baptismal records, and mothers’ maiden names for both parties on marriage records, I knew that this is not always the case for New England Catholic records: often the wife/mother is listed only with her husband’s name, without a reference to her maiden name. However, in browsing some of these early records, while many baptisms did follow this model, I was pleasantly surprised to find numerous baptisms going back to 1789 listed mothers’ maiden names! The earliest Catholic congregation in Massachusetts, largely French and Irish, met in a small former Huguenot meetinghouse in downtown Boston on School Street, before the erection of the Church of the Holy Cross in 1803. However, as these early church records show, Catholic rites were also performed outside of Boston. These baptisms occurred in 1797 in Wrentham, where John and Caroline were living. The first two baptisms are written in English. In between the second and third baptism was another baptism of a child born to a French couple living in Wrentham, written in French; the last baptism of a Francoeur child is also written in French. These various witnesses included various prominent French residents of the greater Boston area. Caroline Plimpton and John Francoeur (who was born in France) married at Boston 10 August 1783. The marriage was performed by Rev. Samuel Stillman (1737–1807), the minister of the First Baptist Church of Boston, which was then in Boston’s North End and is now steps from NEHGS on Clarendon Street. Caroline herself was born in Sturbridge, Massachusetts on 30 June 1759, the daughter of William and Prudence (Marcy) Plimpton. William Plimpton had moved his family to Boston by 1773, when he was listed as being in a militia. In 1777, he was listed as an inn-holder. 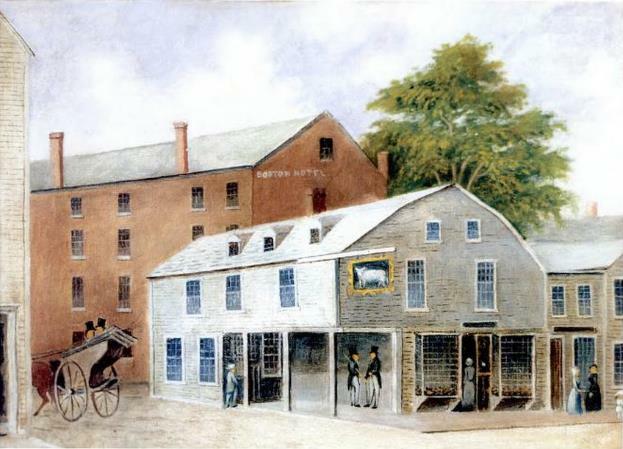 According to family tradition, during the Revolutionary War he kept the “Lamb Tavern” on Washington Street, a portrait of which was featured in our president Brenton Simon’s work Boston Beheld. Caroline’s brother Nathan Plimpton was a privateer during in the 1780s, and her two sisters also married men of French background. Her sister Ursula married Dr. Francis Bertody (1737–1800), born in Persia (Iran) to an Italian father and Persian mother, who grew up in France and reportedly served as a physician to King Louis XVI before emigrating to the United States. Francis and Ursula’s marriage was performed by Rev. 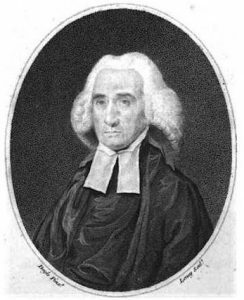 Nathaniel Emmons (1745–1840) in 1785 at the Second Church in Wrentham (Congregational), so the Plimpton family practiced at least three different faiths. Caroline’s other sister Prudence married Louis Cornette (1743–1788), who is described as having graduated from the University of Paris and served as an officer in the army of Louis XVI. Prudence and Louis Cornette also settled in Wrentham, where their house still stands. Cornette was also the 329th coat of arms approved by NEHGS’s own Committee on Heraldry. That’s really just scratching the surface about what can be said about this Plimpton family, with its interesting connections to early post-revolutionary French settlers of Massachusetts, with some very useful items being found in our newly digitized parish records of the Boston Archdiocese. Prudence turns out to be my ancestor’s first cousin! I descend from her maternal grandparents Samuel and Mehitable (Mayo) Morris of Roxbury. The Morris surname continued as a first name in my family down to my uncle Morris Healy (1875–1911), covered in a prior post. Levi B. Chase, A Genealogy and Historical Notices of the family of Plimpton or Plympton in America… (Hartford, 1884), 91. Ibid., 119, with information on the marriages of the other Plimpton siblings described above. Charles Manning Child, “Biographical Memoir of Francis Bertody Sumner,” National Academy Biographical Memoirs 25 : 147. This church is in present day Franklin, which was incorporated in 1778 from Wrentham, although the marriage appears in Wrentham vital records. The New England Historical and Genealogical Register 98 : 201. I descend from Samuel and Mehitable Mayo Morris, too, so I guess we’re cousins of a sort. I’m quite sure my Dad never knew he was descended from this couple, but he named some of our cars “Mehitable”. Even when he named the car “Betsy”, if the car was misbehaving he would say “Come on, Mehitable”. He was a pastor, so maybe “Mehitable” was his bad word! I enjoyed reading this post, especially after I realized these were shirt tail relations. I descend through Abigail Morris and John Perrin. An excellent and interesting article…but we would have appreciated a credit to the American Heraldry Society for the image of the Cornette arms! 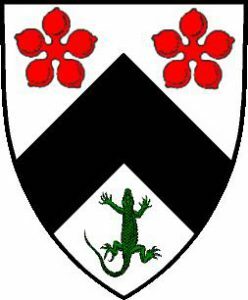 My apologies, I have now added the credit to the American Heraldry Society above. Thank you very much! I browsed the records too as my earliest New England ancestors were married by Rev. Francis Matignon in Boston in 1795. Did you notice there were records from A mission trip to Provodence, RI and a record from Norfolk, VA in the first volume? Greetings. I, too, am interested in Roman Catholic Archdiocese of Boston baptismal records from the 1700s. When the announcement first came out, I found persons of interest in the 1789-1810 index, but the scanned records were not yet available online. Your blog implies that the scans are now online, but I can still find only the index for this period on the NEHGS site… what am I doing wrong?? This is quite exciting to me, because our family records include a very yellowed translation of my ancestor’s baptismal record from the original French, and, sure enough, the index includes her! Okay, I’ve found them by another path.